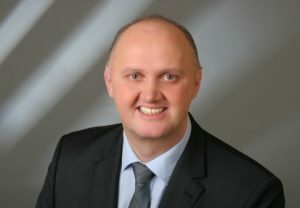 Roland Hünteler (born 1968) studied electrical engineering at the Technical University of Dortmund (Chartered Engineer) and ISEN (Institut Supérieur de l’Electronique et du Numérique) in Lille, France where he also commenced his studies in strategic business management. He began managing projects while still studying, including the digitalisation of the old archives of the Babcock Group and “Check 2000” (Y2k compliance of all computers and servers) for the Citybank Group. As the global sales director for vehicle communication, Roland Hünteler developed the original equipment manufacturer (OEM) business unit from scratch. At the age of just 32, he took over management of the marketing and product management division of Deutsche Telefon Werke AG. This was part of the Röchling AG group of companies. As a member of and business consultant to the European Economic Forum, he represented business interest as well as the interests of Germany vis-à-vis diplomatic missions from across the world in Berlin. Since 2004 Roland Hünteler has built up experience as a consultant and turnaround specialist for companies in the motor industry and telecommunications. In 2010 he assumed responsibility for the restructuring of the Security division of Funkwerk AG. As group CEO he represented the subgroup at the executive board and supervisory board level. Most recently he positioned the “Rohill, The Netherlands” group of companies with agents and offices on all continents. Since November 2015 Roland Hünteler has, in his capacity as managing director, led ProCom, Professional Communications & Service GmbH in Essen, Germany.